As we age we lose volume in our face and also tension in our skin due to a loss of collagen. This can lead to the hollowed out, wrinkled appearance of the face that makes us look older. There are multiple ways to combat the signs of aging. Neuromodulators, like Botox and Dysport, to relax the lines of facial expression and Hyaluronic Acid Fillers, like Restylane and Juvéderm, to fill in lost volume are two of the most commonly performed cosmetic procedures in the world. Sculptra Aesthetic is different. It acts to stimulate collagen production, tightening the skin and replacing lost volume. Sculptra is made up of Poly-L-Lactic Acid (PLLA), a biocompatible, biodegradable compound that has been used in dissolvable stitches for years. This compound is injected under the skin and stimulates your body to produce more collagen in the treated area. The body then breaks down the PLLA and leaves behind your body’s own collagen, filling in the lines and replacing lost volume. The initial Sculptra treatment generally consists of two to three injection sessions, each 4-6 weeks apart. It does take time for the results to be appreciable, generally you will start to notice a difference around 6 weeks after your first injection. 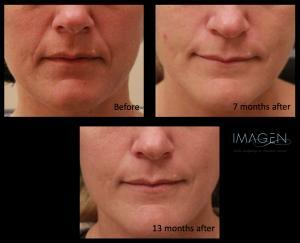 The results* of Sculptra can last for 2 years or more. At that point you may need a “touch up” of a vial or two, but will not generally need to repeat the entire initial series. To see more Before and After photos, please visit our Gallery. Read more on Collagen Stimulation in our blog. For more information about Sculptra or to schedule a complimentary consultation to see if Sculptra could be right for you, Call or Contact Us today!